When any farm animal grows up as a cherished pet instead of one of a herd, it's natural to have a little species confusion. 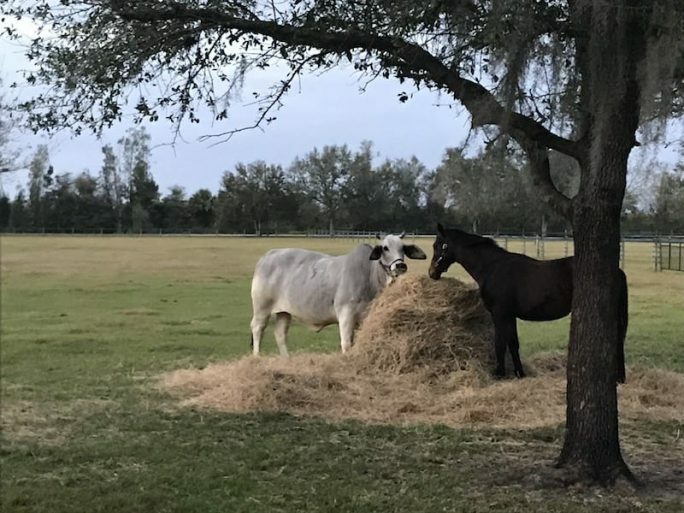 That's the easiest explanation for why Bessie Cow, as the big white Brahma at South Fox Farm LLC is known, thinks she's in training for the 2019 Breeders' Cup Distaff. Now 4 years old (and tragically ineligible for the Kentucky Oaks), Bessie Cow has spent most of her life with humans and Thoroughbreds. South Fox Farm owners Brian Young and Yvette Smith didn't expect to end up with a cow soon after they moved their sport horse operation from Pennsylvania to Fort Ogden, Fla. Smith had always wanted a cow for a pet but couldn't find a veterinarian in her area of Pennsylvania who was willing to work on one. Then, one day when Smith and Young were picking up some hay from a nearby farmer, they caught sight of some young Brahma cows in a nearby pasture. Brahma (sometimes called Brahman) cattle are known for their distinctive hump, floppy ears, and more rounded heads as compared to more traditional beef breeds like Angus. Originally descending from the Bos indicus breed in India, Brahma are known as easy keepers and tolerate heat exceptionally well. Right away, Smith encountered some challenges with Bessie, who had been rejected by her mother. The calf seemed undersized, was glassy-eyed and didn't seem to have a suckle reflex. Smith struggled to get her to drink milk. That wasn't a good sign, and Smith was told (after a week of hospitalization) that Bessie wasn't going to make it. Smith rubbed molasses on the calf's gums and slowly taught her to drink from a bottle. In the early days, Smith was afraid to leave Bessie outside in her pen overnight, worrying coyotes would attack her, so Young carried Bessie to their horse trailer each night and closed her up safely. On Christmas morning, Smith noticed Bessie was disinterested in her bottle and seemed a little rounder than usual. After lots of phone calls, she determined the calf probably had bloat, which can kill a cow if left untreated. She got Bessie to a veterinarian and was again told the calf didn't have much chance for survival. After Smith spent a long night nursing the little calf, she pulled through again. Luckily, Bessie encountered no more hiccups in her journey to adulthood and Smith was then faced with the question of what to do with the cow who had cheated death. 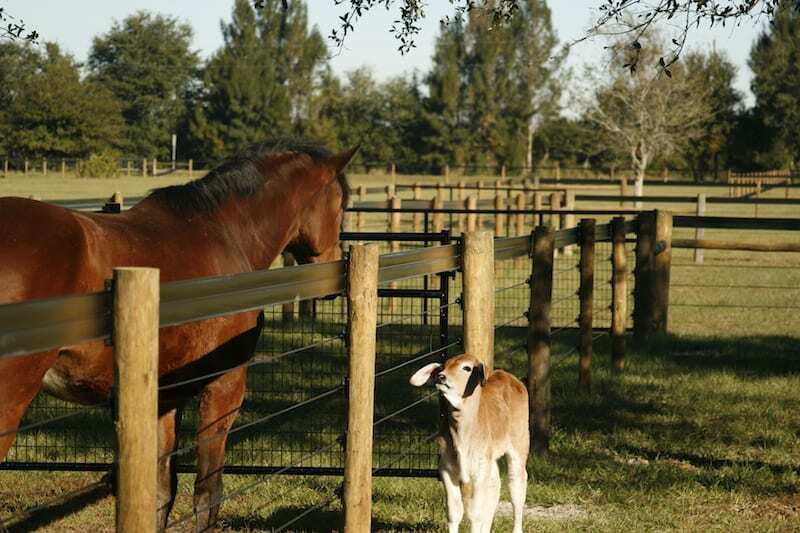 South Fox specializes in layups and boarding and mostly caters to a mix of Thoroughbred and barrel racing clients. At first, Smith thought the cow would be a great companion for her weanlings. The first crop of weanlings she suggested this to were less than certain about the match-up, particularly when Bessie would come bucking across a field, ears flopping and tail swinging. For a little while, Bessie made her home with Smith's retired horses, eventually stepping in when a braver group of babies came along. Now fully grown (and gray, despite being born a fawn color), Bessie is often spotted in the pasture with Smith's young Thoroughbreds, sporting a customized halter form Quillin's Leather shop in Central Kentucky. The halter jokingly attributes her breeding to Thoroughbred stars Tapit and Zenyatta. Bessie enjoys running up and down pasture fencing to race horses in neighboring paddocks and is convinced she's the fastest creature with four legs on the farm. When her weanlings come in for the day, Bessie stands in the barn aisle alongside them, despite not having her own stall. This year, Bessie is serving as babysitter to weanlings by Tiznow and Flat Out. Smith said she's been surprised to learn how intelligent cows (or at least Bessie) can be. “It's amazing how smart they are,” she said. “She knows my truck, she knows my trailer. She moos to me. And if you walk up with strangers, she always knows. She can be two-tenths of a mile away across the field, and she'll come up part of the way and stop. She's smarter than horses. I hate to say it, but it's true. You can follow Bessie Cow and her training progress on her Facebook page. 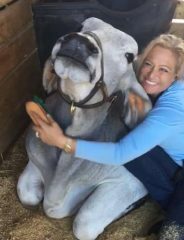 This entry was posted in Barn Buddies, Horse Care, NL Article and tagged barn buddies, brahma cow, cow, Florida horse racing, south fox farm, yvette smith by Natalie Voss. Bookmark the permalink.